My tart cherry love began in northern Michigan but was deepened with the incredible tart cherry sorbet sundaes I’ve had in other places. My tart cherry sorbet recipe is simple to make and the flavor is fabulous, enhanced with a whisper of rose water! I find it ironic that some of the most memorable ice creams of my life were not had here in my homeland. I mean, I live much of the year in Harbor Springs, where ice cream reigns supreme all summer long. Starts Memorial Day weekend when the Yummies and the Kilwins open their doors and the Maureen’s Ice Cream Maker comes out of hiding. There is the all-day-long ice cream snack, the nightly exodus from homes into town from every hinterland of the north, and my own personal devotion to the Kilwins Mint Chip cone. The ice cream mania ends abruptly on Labor Day weekend: the kids are back in school, the frost will be on the pumpkin soon, and no more ice cream for you. So it’s funny to me that when I think on the ice cream moments that have created happy obsessions in my head, I’m going as much far and wide as I am to downtown Harbor. It started in San Francisco, when Chris and I went on an eating frenzy like none other when he was out visiting. We pizza’d around the corner from my house at Delfina, where we ordered an ice cream sundae that took everyone at the table for a spin. The cherries on top of cherry was an insanely good combo. We got details then and there, and my brother went direct to his phone to order the Amarena cherries, which have rocked my cherry-loving world ever since. Then in Florida. It’s not like I was “going for an ice cream.” No. As in SF, I was “going for a pizza.” But at Barbatella in Naples, this in my secret soul means “I’m going for a cherry sundae.” I’m such a freak for great pizza that I was able to keep a lid on the ice cream goal for a couple of years, but now it’s obvious because when everyone is ready to leave the scene of the pizza crime, and our server asks if we’d like dessert, there’s that general, mumbled consensus of couldn’t-eat-another-bite—except for me, where I raise my voice over all of that refusal to say: two cherry sundaes please. I have to order two because if I don’t there won’t be enough for me me me. Here I am now, in the Cherry Capital of the World, with fresh tarts and sweets all around me . . . and nary a tart cherry sundae in sight. Don’t get me wrong: these summer ice cream daze are not diminished by my deep desire for the tart cherry sundae that doesn’t come from here—it’s that all of the ice cream craziness just makes me want more. More mint chip, yes, but also the cherry sundae I’ve never had up here. My niece was on to me when we were talking favorite flavors and I said my usual Mint, and she reminded me of the cherry sundae she has witnessed me swoon over more than once. She said we should make it, and I realized that yes, we can! How liberating it is to a craving to remember that it’s not dependent on place! As Maria said: we can make our own! And so can you. Ice creams, sorbets, gelatos, sherbets (which is sorbet with cream in it): all of this is not so mysterious to pull off as I once thought. 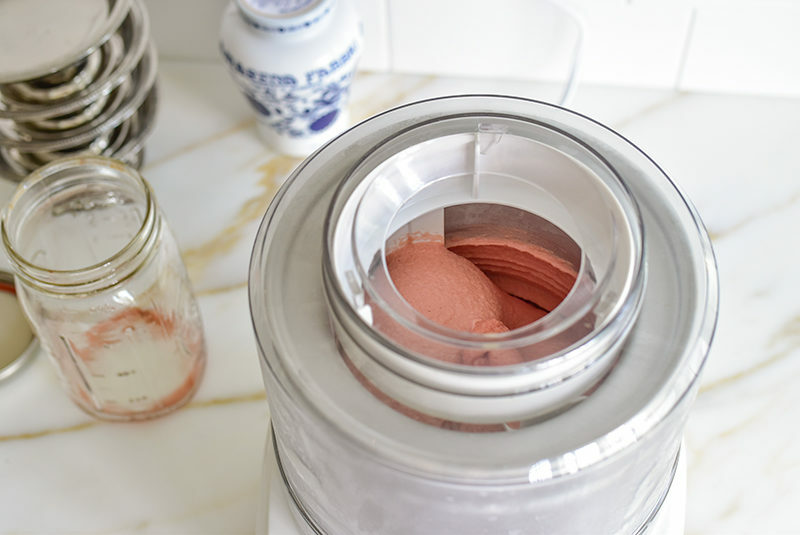 You make your base, which in the case of a sorbet it feels a lot like the liquid popsicles in long plastics that need only be frozen, chill it and then process it in an ice cream maker. I go simple on the machine, an inexpensive one from Cuisinart does the job. Oh, and a word (or rather, a love note) about the Fabbri Amarena cherries on top . . . these cherries are the darling of my pantry. Get a jar, which in itself is gorgeous. You will find uses for them all over the place, topping sundaes or yogurt or labneh or cakes, in cocktails, lemonades, or eaten from a spoon, just one in syrup, when you want to give yourself something special. A little trick of the trade: buy them from a restaurant supply shop (like webstaurantstore.com). Pricing is great, and you can also find things like the lovely little footed stainless ice cream dishes, so handy and beautiful. 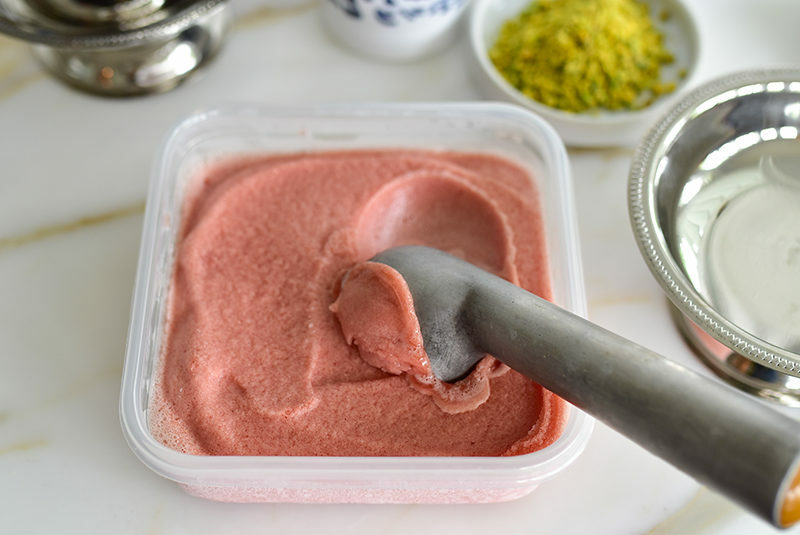 This recipe is based on the one for Pomegranate Rose Sorbet in my cookbook; rose water enhances tart cherries beautifully too. 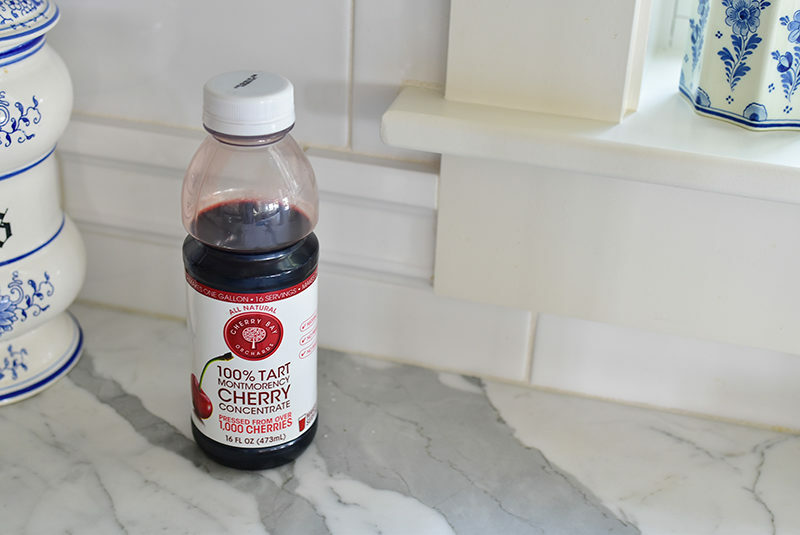 Find tart cherry juice concentrate at Whole Foods, health food stores, or online. 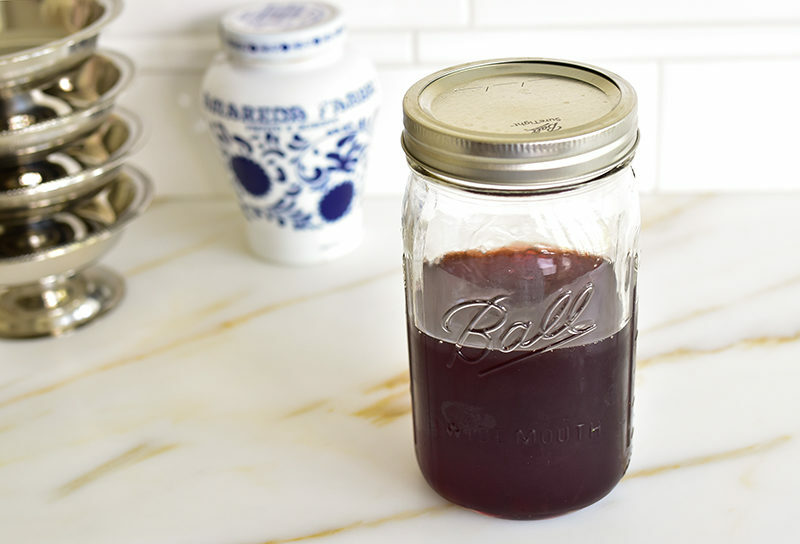 If you prefer to use fresh tart cherries, that works wonderfully too. Puree 3 cups of pitted tart cherries (from frozen is fine) and substitute that for the cherry juice concentrate and water. Be sure to use tart or sour cherries rather than sweet cherries for that particular tart cherry flavor. The corn syrup is used to help keep the texture of the sorbet smooth. Find Italian Fabbri Amarena Cherries online. 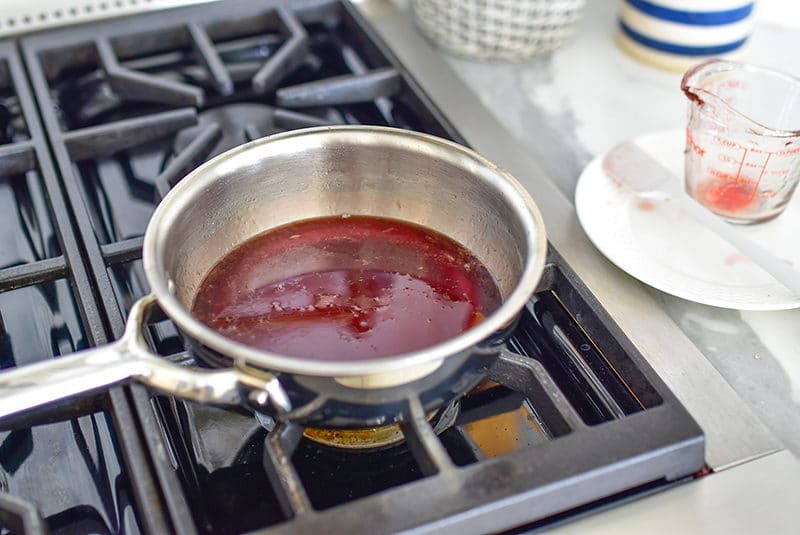 Combine the cherry juice concentrate, sugar, corn syrup, and water in a small saucepan over medium heat. Cook until the sugar dissolves, stirring occasionally. Add the lemon juice and rose water, and continue to cook for another minute. Chill the base until completely cold, either in the refrigerator or by placing the base in a zip lock bag immersed in a bowl of ice water. 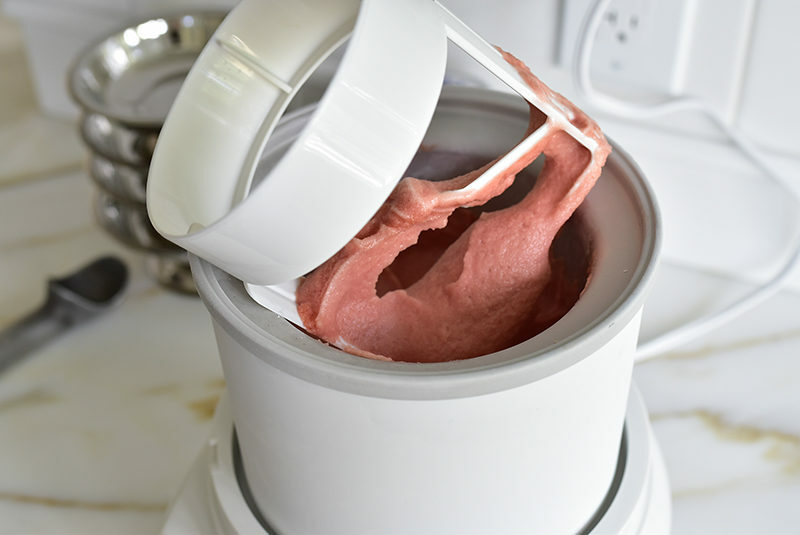 Process the sorbet in an ice cream maker according your maker instructions. In mine, a Cuisinart, simply freeze the maker bowl in advance. 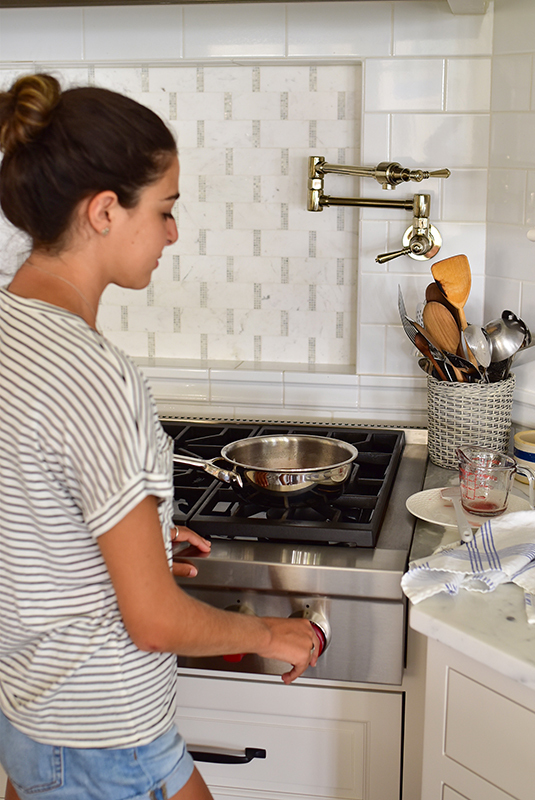 Freeze the sorbet for at least 24 hours so it hardens properly. 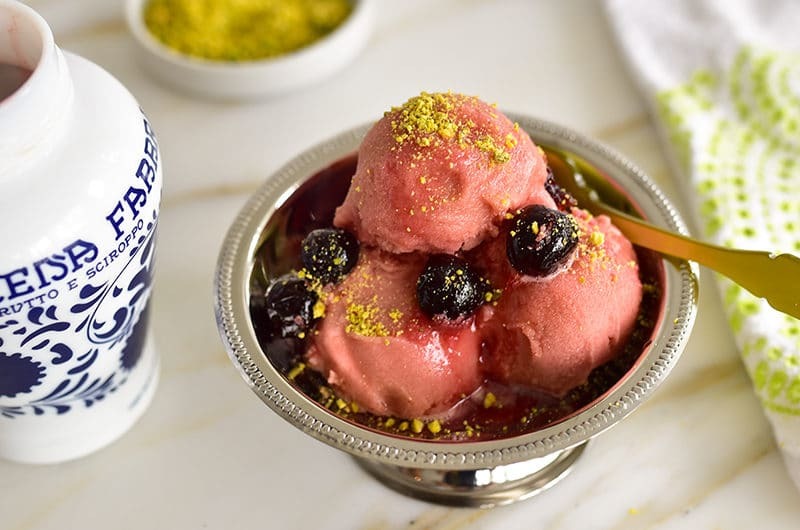 Serve scoops in sundae dishes, topped with a few Amarena cherries and their syrup, and chopped pistachios.